Training has been rendered to a position akin to prayer in organizations – do it and hope something happens! At Mentor, we believe learning can be engineered to deliver measurable business results. Result Oriented Learning Engineering (R.O.L.E) is a patented, proprietary approach to Learning in Organizations that brings a fresh perspective. R.O.L.E is a process that has evolved over 13 years of in-depth research, live experiments & refinement by Mentor Learning and continues to surprise us with its potential for higher efficacy & outcomes through learning. R.O.L.E is inspired by some of the truly path-breaking thought leaders like Donald Kirkpatrick, Maria Montessori, Robert Gagne & Benjamin Bloom, not just by their seminal works, but through a creative interpretation & application of their work to the benefit of individuals and organizations. R.O.L.E draws from multiple disciplines of study such as Neuroscience, Behavioural Economics, Engineering Process, Psychology & Design to blend the insights into a seamlessly implementable learning design process. With the Business Objectives, Strategy & Processes – the key variables of business leadership – not easily alterable, the only thing left to influence for the leader is people behaviour. R.O.L.E is a proven path to translate expectation to consistent action! The depth of the R.O.L.E derived learning framework for every intervention we do, and our robust process and use of technology makes implementation, follow-up and reporting a breeze! Click here to discover how Human Transformation through R.O.L.E helps businesses & its leaders? Training is relatively easy! Learning is relatively tougher! Especially adult learning! Knowledge transfer through training doesn’t deliver business results!, it needs to lead to measurable actions that are consistent with business expectations. Learning is when the learner articulates the knowledge & skills gained as “Behaviours” that when displayed consistently produce the desired business outcomes, eventually delivering effectiveness for organizations. L&D is not a budget to spend during happy times and cut during not so great times! Unfortunately that’s the truth as L&D today is prayer, which has no way to measure resultant outcome, if there is any! – R.O.L.E turns this practice on its head and makes it an investment that probably yields the best Return. It enables the business leader to know Why the program is needed, Which business result area will it impact, Who needs to attend the program, What behaviours need to be influenced, When will the impacts begin to show, Where will the impacts show first and How would the resultant outcome be measured – after all, What gets measured, gets managed and if it can be managed well, it deserves to be invested into! 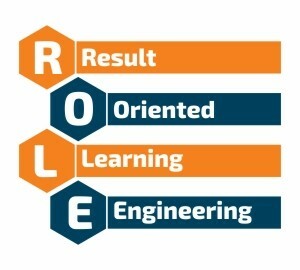 R.O.L.E ensures that Business problems and impact needed are central to the learning design, and learning is effective only if it creates measurable business impact, and when the organisation doesn’t have to invest for follow-up but Ownership for learning is taken up by the employees & their managers. R.O.L.E is all about contextualised learning for your specific needs either in Standard, Custom, Consulting, Organisational Performance Enhancement assignments. It is not a One-Size fits all approach – as your needs are unique! Talk to us today and let’s see how R.O.L.E can help transform your business!